Welcome to part 2 of our series on how to cut your pet’s nails. Today we’ll be discussing the basics of clipping claws on cats. Luckily, if you read yesterday’s post, there’s a lot of overlap in feline and canine nail cutting techniques. However, cats are notoriously less social than dogs are so it might be a bit more difficult if you don’t work extra hard on conditioning your cat for trimming nails. This process works very similarly to the one for dogs. You have to start handling a cat’s paws immediately. They are less likely to sit still for it, and much more likely to give you a painful bite or swat for your trouble. So to avoid a trip to the first aid kit, it would behoove you to wait for an ideal opportunity. Wait until your cat is taking one of its dozen daily naps and softly touch its paw. Most cats can’t stand this, so they’ll either pull away, or walk away. Don’t force the issue. If the cat is finished then let it be. However, every time you get the opportunity this is a process you should repeat. It’s best to combine paw handling with regular petting as well. That way the cat will start to associate their paws being touched with pleasant sensations. Eventually, the cat will become comfortable with you touching its paws. Now’s the time to take it a step further, and inspect the paw. 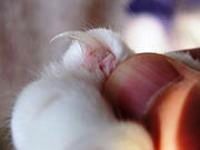 Use your thumb and forefinger to squeeze the cat’s finger joints. This will unsheathe the cat’s claws. You can see from there whether there are any splits or cracks. Those are clear signs it’s time for claw clipping. Many of the same tools used for trimming nails on dogs can be used for cat claws as well. However, a rotary tool should never be used on a cat, and scissors style clippers should only be used on the dew claw, which tends to grow in a circle because it isn’t ground down while walking or clawing. You can even use a regular pair of human nail clippers. Just make sure to be extra cautious. If you think your dog was upset when you accidentally trimmed too far, you’ll be shocked at the cat’s reaction. They’ll never forgive you. 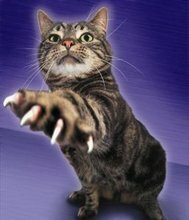 Cat quicks are easy to avoid because of their lightly colored claws. You can clearly see the pink hued quick within. If you have an especially squirmy kitty, have a friend hold it still while you’re claw clipping. Otherwise place your forearms firmly over the cat’s shoulders and hips to hold it in place while you’re trimming. You’ll find it easier to clip more than one claw at a time in most cases, so fit as many claws beyond the cutting line as possible, make sure you aren’t beyond the quick, and make a surgical strike. It’s also best to keep nail trimming on a schedule. Once every 10 to 14 days is good. And never ever try to cut cat nails when the animal is agitated. It won’t go well. That’s all for today’s post. Check back again tomorrow for our final summation on animal claw clipping!